Our intention for this retreat is for you to find a deep connection with the dolphins, unleash your heart wisdom, turn up the volume of inner knowing and bring healing to yourSelf and all beings around you. 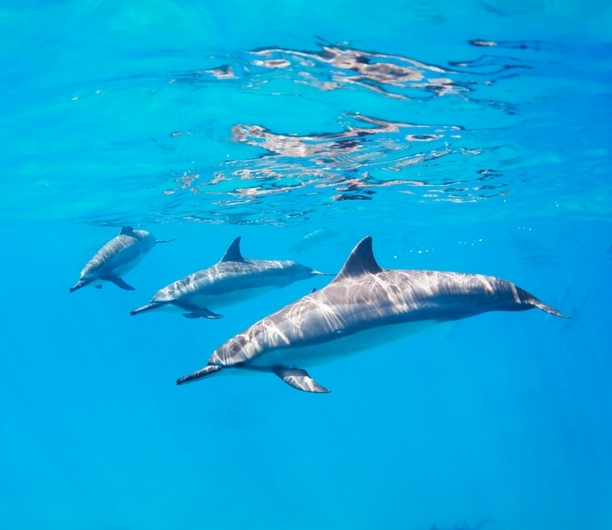 You will have the gift of a week’s retreat to immerse your mind, body and soul in a daily programme of meditations, animal communication classes, heartfelt conversation and a deep connection with dolphins in the wild and nature (within and without). This supportive space is held by Nicola Molino of LaviaNaturale and Pea Horsley of AnimalThoughts who accompany you for the entire trip. A huge group of dolphins live in a wonderful reef and it is easy to see them and swim with them (by their own choice). Please note as they are living beings free in the wild we can not guarantee that we will meet them. October is high season and one of the best months to go to Egypt. What type of dolphins are common to the Red Sea? Eight species in total. Seven species have been resident for a long time – the Bottlenose Dolphin, Bryde’s Whale, Indopacific Bottlenose Dolphin, Pantropical Spotted Dolphin, Longbeaked Common Dolphin, Risso’s Dolphin and the Spinner Dolphin. Recently Humpback Dolphins, who’s normal habitat is the east coast of Africa, have also been seen in the Red Sea as far north as El Gouna, some 280km north of Marsa Alam. Which are you most likely to see? Probably one of these three species – the Bottlenose Dolphin, the Indo-Pacific Bottlenose Dolphin or the Spinner Dolphin.